Today is an important day in the social calendar of Westray. It’s the day of the 75th Annual Westray Industrial Show. Entries have already been delivered to the designated drop-off points, clearly labelled with their section number and class, with the competitor’s name inside. Judging has already taken place. It’s time to see who has won such fiercely competitive sections as ‘Fattie Cutties’, ‘Bere Bannocks’, ‘Oatcakes medium with shortening’ and ‘Potatoes, Long, Coloured’ and the all important ‘Cabbage, round’ section. There’s a lot at stake – pride as well as individual prizes for each section, with a First Prize of 60p, Second Prize of 50p and Third Prize of 40p. This year there were even more entries than last and great long tables were bursting with the best that the Island has to offer. In the nearby tea room, the same was true. Delicious salad rolls, freshly baked fancies and homebakes and tea and juice. Plus, of course, great company. Method: Melt marg. Mix dry ingredients. Add margarine and mix with milk. Roll out on lightly floured board thinly. Cut into squares and bake on a not-too-hot griddle. Eat. (For completion’s sake, Gabriel did achieve a Season’s Best cake record but slowed significantly in the finishing straight). 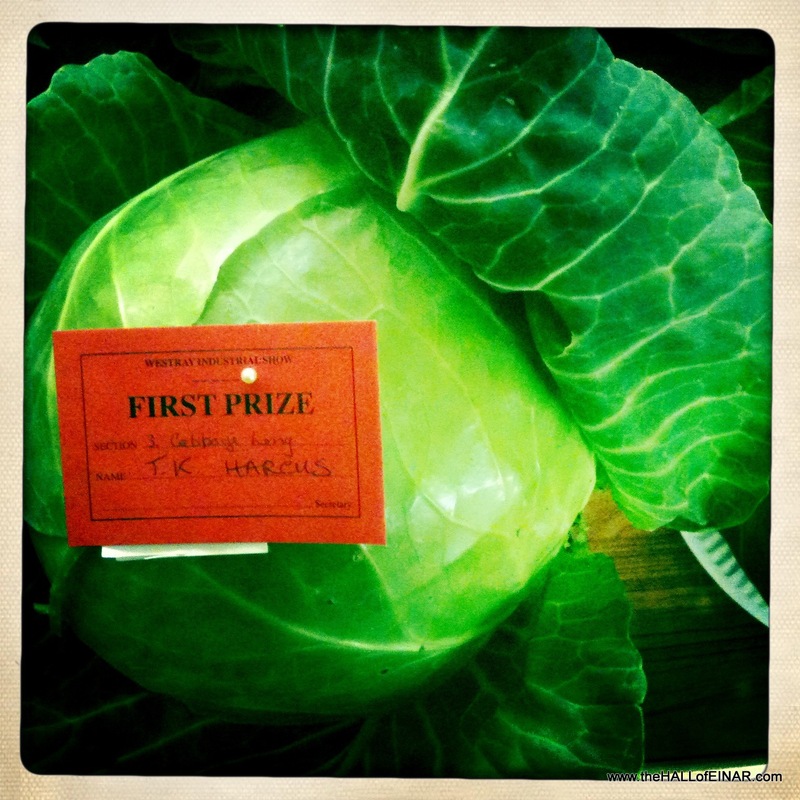 One Response to "Competition Cabbage"